The anti-UVB efficacy and high performance unmatched "extreme anti-UVA" performance of Photoderm AKN safely protect against sunburn, prevent sun intolerance and the fight against premature skin aging. - A major advance against the risk of cellular damage, its exclusive patented Cellular Bioprotection provides optimum protection of skin cells. - Its complex sebo-correcting Fluidactiv helps keep skin healthy and clear. Bioderma innovation, the complex sebo-correcting Fluidactiv improves the quality of sebum and thus helps keep skin healthy and clear. 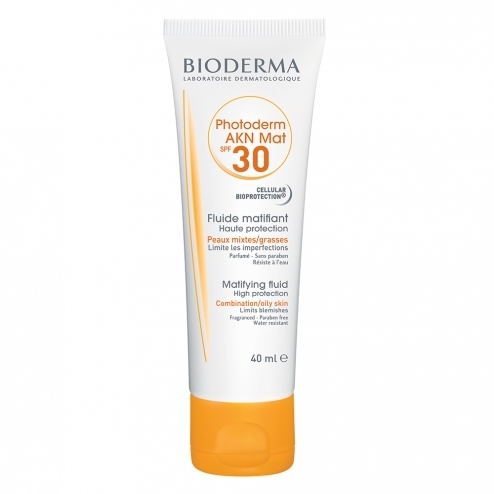 Apply generously and evenly before exposure Photoderm AKN on carefully dried skin. Reapply frequently Photoderm AKN and after swimming, friction or sporting activity.